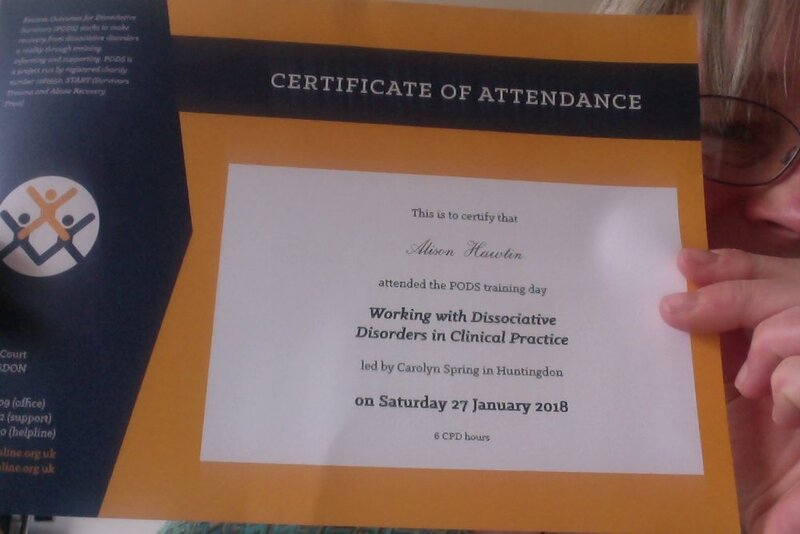 The other day I went on a course that inspired me to write! Carolyn Spring, founder of PODS-ONLINE.ORG.UK an organisation based in Huntingdon, to support and inform about Dissociative Identity Disorder (DID used to be known as multiple personality disorder), is an accomplished speaker, offering respectful context for depth of content with simplicity of presentation which I aspire to...but that's another blog. We were there, considering the clinical implications of working with DID. She spoke of the impact of trauma on the body and mind, and the admirable and utter resilience of our human-ness that finds ways to cope and survive. "Trauma by definition is unbearable and intolerable" (from another great speaker Van de Kolk in his book 'The Body Keeps The Score' 2014). It is, a human experience that I have lived and worked with actually all my life. I lived in a family that fostered many children from highly traumatised backgrounds. I had parents with the same heritage. I always gravitated toward helping the underprivileged and those without voice (animal and human) in some way or other my whole life. I volunteered in special schools, specialist units, a Romanian Psychiatric hospital - and I found the voice for this myself through art and connection. I worked in NHS Art Therapy Services with adults with the label of learning disability (LD) for almost 20 of my years, and spent time with trauma every day in a different way. A person with a LD carries non-verbally their very first significant trauma, that of the organic brain damage and/or syndrome they're born with - as well as the impact this has/had on the emotions and relationships that then develop around them (see books by Valerie Sinason a leading psychotherapist in both fields of LD and DID). For the people I worked with here in art therapy, the suffering had become so intolerable, so distressing in some way or another, that they had reached our doors within NHS Community and In-Patient NHS Specialist Services. I was happy that I worked for a Service that believed all people (including those with LD which was less popular in the 90's) could benefit from creative psychological therapies. We offered both Music and Art Therapy that people could receive this for free on the NHS. I saw every day the value, benefit and success of Art Therapy. I remember a colleague and I discussing how wonderful it would be if we had a machine that could measure what's actually going on in someones brain and body when we were working with people, to measure and prove the changes and experiences we had the privilege to witness. Of course now we do, and the neurophysiological evidence is there to find. It proves relationship, play, creativity, art, and boundaries matter. We all of course, have our ways, defences and tools of managing our emotions and lives, including many that are on the edge of unhealthy/unhelpful, become less helpful or take us by surprise once a number of traumas have accumulated to beyond our tolerance levels, We don't all need therapy of course, but art Therapy can help with all of these, I've seen it. Thankfully most of us have not suffered such a level of significant trauma that creates DID, but if you feel you or someone you know might suffer from this do go to the website and take look for help and advice. There is also a Directory of Trauma-Sensitive Therapists that they can advise you on. And yes, I am on there.